Before we dive into this week’s blog post, we would like to take this opportunity to introduce you to our new Steam Creator page. The Steam Creator page acts as a hub for all things TaleWorlds on Steam. Make sure to follow the page to ensure that you don’t miss out on any news or announcements regarding our company and our games! Mount & Blade II: Bannerlord is a bit different from other sandbox games. There are some in which the story isn’t linear, so you can more or less play it in any order while you explore the world. In others, there is no such thing as a broad story that encompasses the whole game, or if there is, it is less important than the world itself and its inhabitants: you are free to roam to discover them. What we intended to do with the original Mount & Blade, and what we are working hard to do even bigger and better in Bannerlord, is to create a game where you get to create your own story from scratch, where you make your own decisions and live through the consequences. 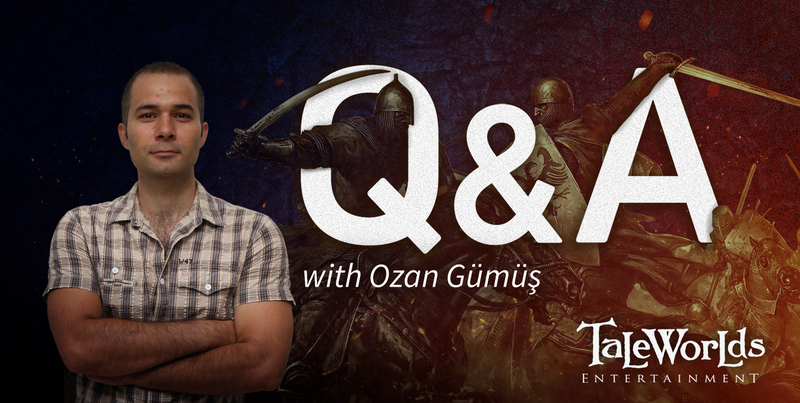 In this week’s entry of our dev blog, we talk with one of the people responsible for creating this magic: Campaign AI Programmer, Ozan Gümüş. If we think of Mount & Blade II: Bannerlord as a “box of tools” you can use to create and live your own story, he’s one of the people who help to create and shape those tools. “I can answer this question in two ways: what I do now, and what I did in the past. In the past, I was generally trying to build our living sandbox world, which is almost a simulation of the real world. There are wars, enemy and ally kingdoms, lords with different characteristics and other aspects which mirror the real-world Middle Ages... From time to time, new armies will gather and try to attack the weak points of their rivals, capture rival fiefs or raid enemy villages. At the same time, caravans are carrying goods from where they are cheap to where they are expensive, making profits for the owner of the caravan (who can be a well-known merchant in a town, or even the player themselves). Each village produces new raw materials each day and villagers carry these resources to connected towns. Each day, the residents of towns are consuming these resources and paying taxes. The collected taxes are then given to the clan which owns the fief. While villagers are carrying their goods to town, they are vulnerable to attack from bandit groups and they can be killed and their items stolen. Each night, new bandit groups are spawned around hideouts. This means that even bandits can damage the economy of a clan if they populate a hideout which is close to a village. All of these elements come together to create the sandbox world and present players with activities and objectives to pass the time. Each game element is connected to other somehow and we try to make the world as realistic as possible to make players feel like a real lord in Calradia. “In Bannerlord, the power of a kingdom doesn’t come from just its total manpower count, but also from the economic power of each clan within the faction. Through taking different actions, players and kingdoms can win wars just by restricting the income of their rivals. In Warband, this side of the game was quite weak when compared to Bannerlord because NPC lords never suffered from a shortage of funds. However, achieving this was quite difficult because we needed to create an economically balanced game world (the total amount of money in circulation shouldn’t increase too much over time). “The first rule for creating a realistic world for our game was to make NPC lord and kingdom armies make rational decisions. We had to ask ourselves questions such as: after one army has gathered and laid siege to a town, what should the besieged town’s faction do in response? The answer may seem quite easy, especially if their army is patrolling in the area, however, what happens if the army is involved in an offensive siege of its own? Should they abandon their siege to head home and defend their own lands? “Currently, I am working on income and expense issues. In Bannerlord, clan wealth is mostly controlled by the clan leader, and all taxes are sent directly to them. However, the clan leader is also responsible for nearly all of the expense issues too (except for some minor personal expenses like recruiting troops and purchasing food). Each clan member is expected to deal with these minor expenses themselves, however, clan leaders can choose to gift money to their clan members. There are actually a lot of additional mechanics surrounding clans but it would be too much to explain right now! MORALE IN BATTLES: WILL THERE BE A CHANCE FOR A BATTLE THAT DOES NOT END IN A TOTAL BLOODBATH ON EITHER SIDE?